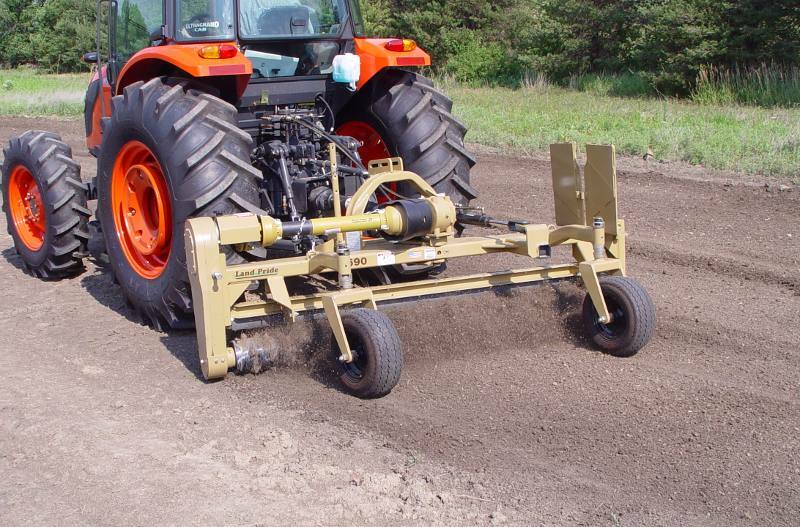 Land Pride's PR16 Series Powered Rakes is a multi-functional seed bed or soil surface preparation tools for landscapers and turf care professionals, capable of grading, leveling, shaping, cultivating, renovating and pulverizing various types of soil surfaces. 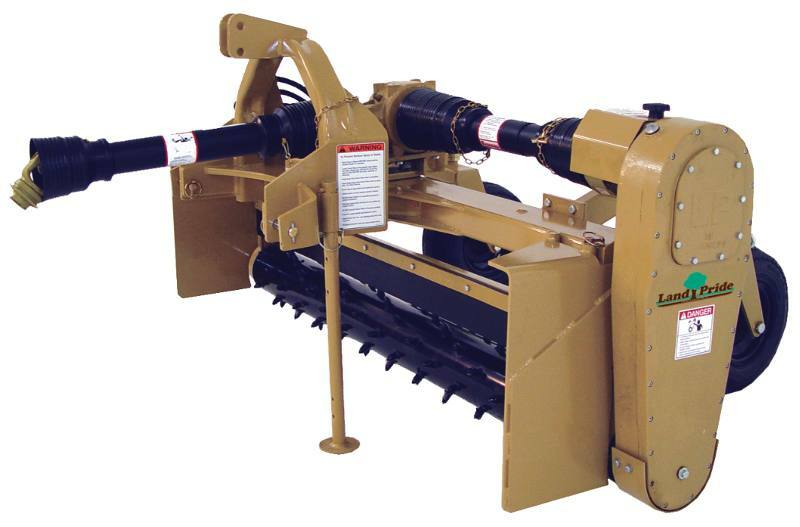 They are also capable of raking or windrowing soil, rocks, and construction site debris. The 60” or 72” working widths are a good choice for smaller or “space restricted” landscaping and turf renovation jobs, while the 90" model is perfect for large jobs such as golf courses, sports areas, or campuses. Cat. 3 drivelines with slip-clutch on second driveline: Slip-clutch offers protection to the gearbox and entire power train when a tough obstruction is encountered with the roller. 6" x 3" x 1/4" Tube Frames: Superior in strength. 3/4” x 1 1/2” Carbide Tipped Studs: Carbide tipped studs are very tough, used in the mining industry, this offers a long life to the studs. Studs can be replaced one at a time. 15 Degrees left or right angling: By angling either direction, the user has many options on what direction to work his area. Gauge wheels with sealant: Easy to adjust vertically to set working depth. Has tall and wide tires that keep turning in fluffy soil. Sealant helps seal against punctures. End plates with storage: End plates can be used to hold dirt to aid in filling low spots. Easily store the end plates on the Powered Rake so that they are always with the Rake when needed. Material control deflector: Material control deflector is used to determine what size of material to let pass through the roller and what size to move out. #50 Double continuous roller chain: Double roller chain can take the fluctuation loads from the roller due to varying ground conditions. Cast Iron chain guard housing: Strong enough to protect chain in harsh conditions. Drive chain enclosed in oil bath with drain plug: Oil keeps the chain and sprockets lubricated to keep abrasion to a minimum. Easy to maintain and change oil level. Replaceable skid shoes: Skid shoes protect larger and vital parts of the unit. As they wear due to soil contact, they can easily be replaced. Non-Angled Working Width: 90 in. Angle Cylinder: 2 in. x 8 in. Chain Case Lubrication: Shell Gradus S2 V2200 00 flowable grease - Land Pride Part #821-045C (32 oz. bottle). Add gear lube until it escapes from lower plug hole. Equivalent to 2 1/2 pints.